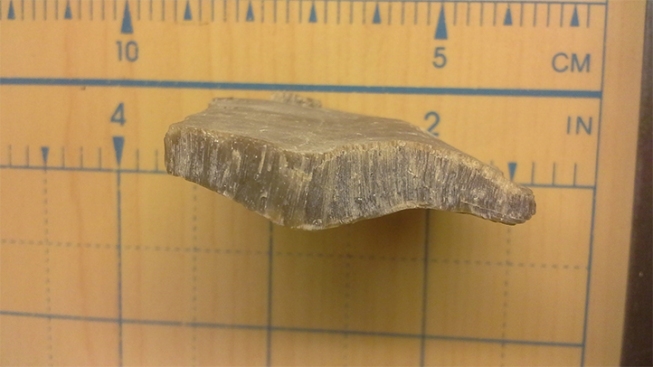 Fossil shell fragment belonging to Inoceramus. Note the parallel prisms of crystals characteristic to this group of clams. The Dallas-Fort Worth Metroplex provides a unique opportunity to find fossils in an urban-suburban environment. While the pavement of parking lots, road asphalt, and sod lawns may not seem like the scene of a glamorous dinosaur discovery, the most important ingredients to discovering fossils are all here — the recent erosion of rocks that entomb fossils and the eyes of a curious human to see them. One example is Ellie May, a nearly complete skeleton of a Columbian Mammoth on display at the Perot Museum of Nature and Science. The skeleton was discovered by a backhoe digging in the sand of a quarry in Ellis County and excavated from what was once a channel of the ancient Trinity River during the Ice Age. Though this fossil was initially uncovered by machinery, we can find much older fossils with only our eyes and we might pass these fossils every day without noticing them. The abundant white rocks found throughout the area are an example. A great place to find them is in White Rock Creek (that feeds into White Rock Lake and for which the reservoir is named). These rocks are part of the Austin Chalk, the same white rock that makes up the white slopes of the Balcones Escarpment that extends from Dallas to Austin along I-35. Chalk contains many easily recognizable fossils like shells belonging to oysters, gastropods, and clams. Some of these may not be as identifiable and may appear more mysterious. Small fragments with tiny prisms are common in the Austin Chalk, shown below. These prisms were part of gigantic clams called Inoceramus. While these may not seem like remarkable discoveries on their own, it is important to note that we are finding these seashells over 200 miles away from the nearest ocean of today, the Gulf of Mexico. Fossils are keys to understanding the past and how the Earth has changed — and they are accessible to everyone. In this case, the fossils reveal a window into a time when DFW (and much of Texas and North America) was under a shallow inland sea called the Western Interior Seaway. Fossil shells are not exclusive to the Austin Chalk and White Rock Creek but are found throughout our region. 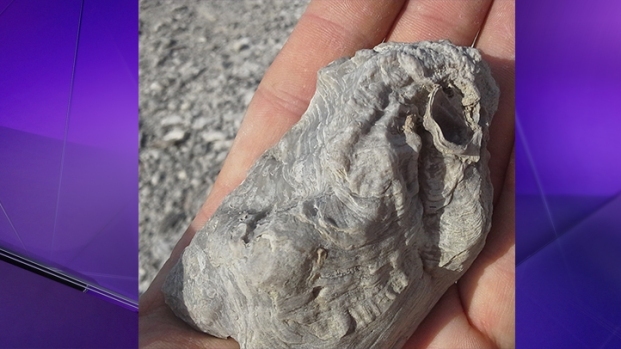 The oyster Ceratostreon, pictured below, was found south of Fort Worth. Ancient seas over DFW not only contained invertebrates such as clams, oysters, and sea urchins (much like today’s oceans), but also hosted larger animals like fish, sharks, and almost other-worldly predators. Marine reptiles also lived in this area, and the DFW Metroplex is one of the best places in the world to find plesiosaurs and mosasaurs (like the Mosasaurus in the movie Jurassic World). When DFW Airport was being built in the 1970s, construction crews discovered a plesiosaur. The skeleton was excavated by paleontologists at Southern Methodist University and was once on display in the Braniff Airways Terminal in the airport. Dallasaurus turneri, one of the oldest known mosasaurs in North America, was found in a housing development in Dallas County. Studies by scientists at SMU have shown these specimens to be key in understanding how mosasaurs fit in the tree of life. The Perot Museum of Nature and Science is a fantastic gateway to not only some of the important fossils of the area, but beyond. The Museum features an exclusive exploration into dinosaurs that lived in the Arctic of Alaska, and through the traveling exhibition Ultimate Dinosaurs, into dinosaurs that lived in the southern hemisphere. However, the gateway to the past is also, right beneath our feet.